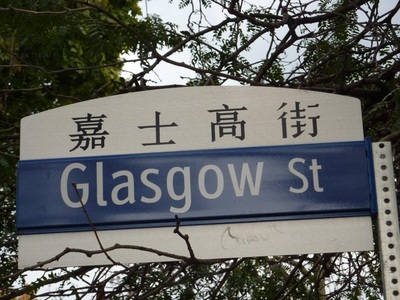 A walking holiday in the second largest country in the world seemed a bit ambitious for beginners, but my wife was keen to go. Fortunately we were covering just part of the eastern side of the country, and in manageable chunks. 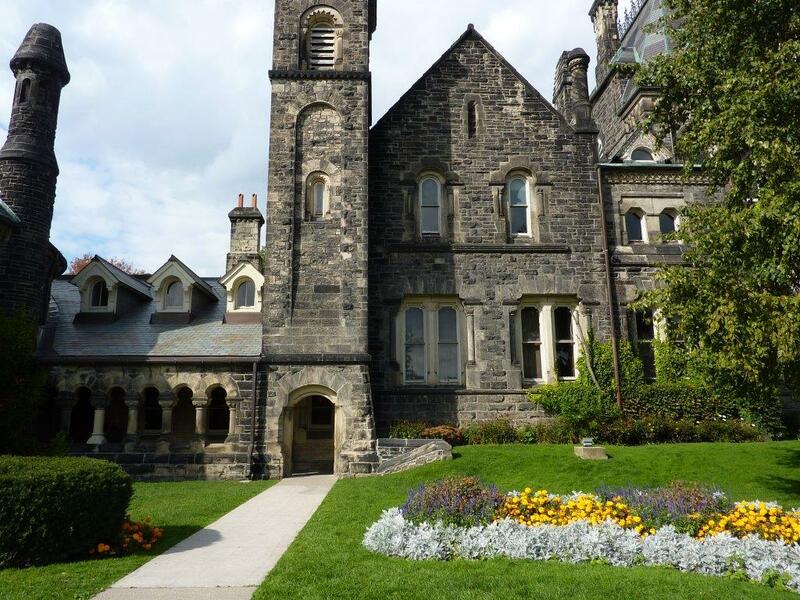 Our itinerary covered Toronto, Quebec and Niagara, some of the highlights of this vast country that is home to only 35 million people, less than the population of California. So, armed with waterproof jackets and our most comfortable walking shoes, we set off on our adventure. The rest of our party had already spent four days in and around Montreal before driving up to Quebec so we flew Air Canada to Montreal and then changed to a very noisy 40-seater for the 35 minute hop to Quebec. However, flying lower than usual we got our first glimpse of the colourful display the trees put on in Autumn. We met up with the rest of the group at dinner but they were not surprised when, shortly after, we decided it was time for bed. The next morning we boarded our coach to the toughest walk of our trip. 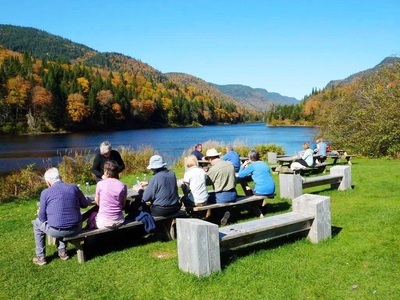 A short drive took us to the Jacques-Cartier National Park, 260 square miles of mountains, lakes, rivers and walking trails. Blessed with almost cloudless blue skies, warm sunshine and trees turning to their autumn shades of red and gold, we chatted to our new-found friends as we walked the steep inclines through the forest. As the going got tougher and trails became staircases, conversation ceased and it became a struggle for us two beginners to keep up the pace. Thankfully our guide, Jean-Francois, made regular stops to admire the view and allow us to catch up. Those views were fantastic and well worth the climb, and as the trail started to descend we felt we had already achieved something special. We stopped at the Visitors Centre and Jean-Francois produced picnic lunches for us all at a spectacular location, right on the water’s edge. 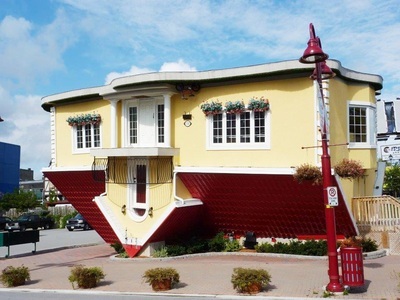 It couldn’t have been better. Later that day we had some free time to explore the old town of Quebec. The old part of Quebec City has a strong European feel and is the only fortified city in North America north of Mexico. 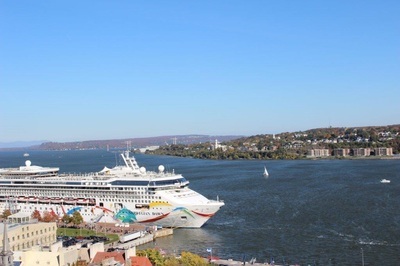 It is divided into the higher and lower towns, the latter being right at the water’s edge of the St Lawrence Seaway and offering moorings to an increasing number of cruise ships. 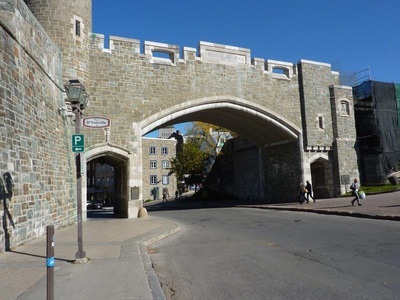 We enjoyed walking along part of the fortification walls and gates that stretch nearly 5.0 km around the edge of the old city. The streets are lined with buildings of great character, none more imposing than the Chateau Frontenac. 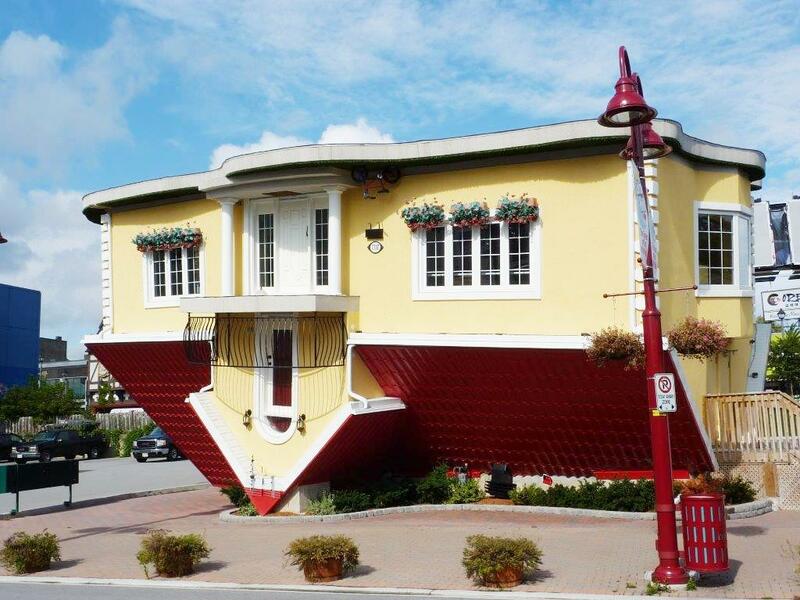 It claims to be the most photographed hotel in the world and we could see why. 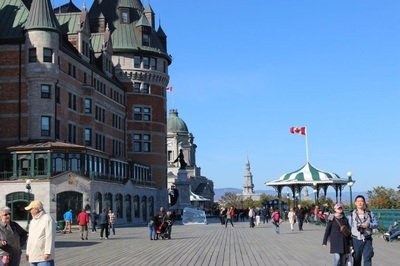 We walked along the boardwalk past the hotel to the Citadel and the Plains of Abraham where, in 1759, the English and French armies, under Generals Wolf and Montcalm, battled it out. 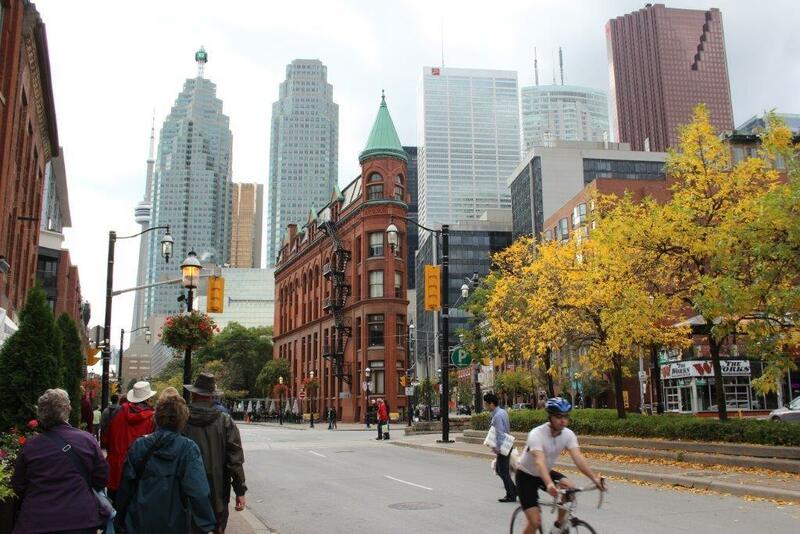 The Plains are now a spacious urban park and being right in the City are easily accessible to locals and tourists alike. After a short flight the following day we found ourselves in Toronto. Originally named York, it changed its name to Toronto in 1834. 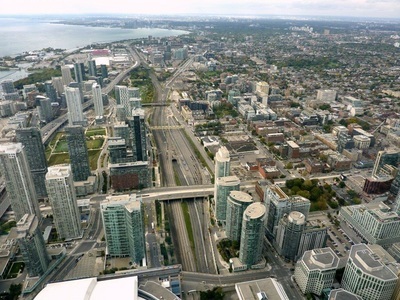 Situated on the northern shore of Lake Ontario, towering new skyscrapers and ongoing re-development are evidence of the rapid growth the city is experiencing. Tallest of the structures is the CN Tower and the best way to get an overall view of the city is from its revolving restaurant and viewing platform around 1,150 feet (351m) above the ground. 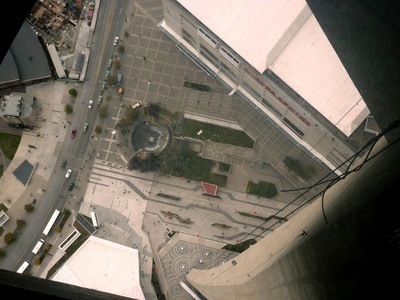 If you are brave enough you can also venture onto the vertigo-inducing glass floor. 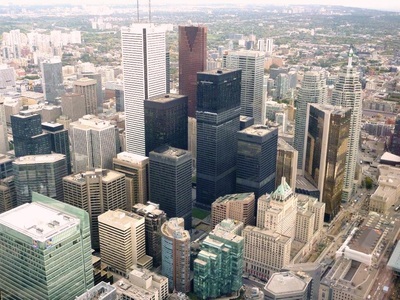 Toronto is the commercial hub of Canada and home to the Canadian Stock Exchange as well as Canada’s five biggest banks. This contributes to not only a high standard of living but also high housing costs and high-rise accommodation. 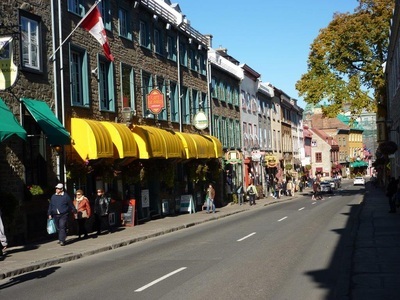 However, it’s not all concrete and glass skyscrapers, some older building survive including the famous red-brick ‘flat iron’ building and the St Lawrence Market, an indoor market founded in 1803 and full of stalls selling fresh fruit, vegetables, meat and fish. 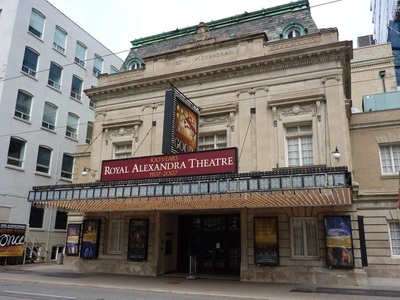 Toronto is also a major Arts centre and boasts theatres, concert halls and galleries as well as the University of Toronto which dates back to 1827. 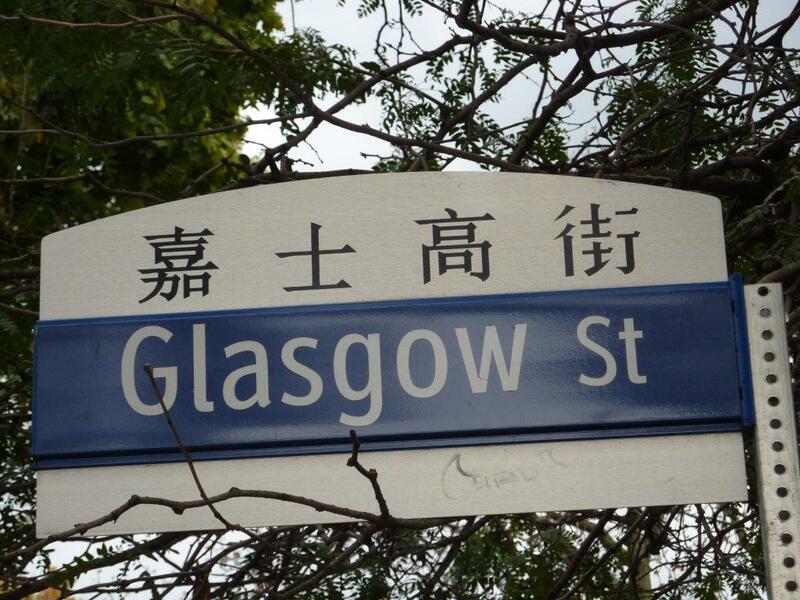 The city is culturally diverse with more than 80 ethnic groups. Street signs often proclaim the nationality of the immigrants who built their community there so that throughout Toronto an intriguing mish-mash of groups have worked their way into the fabric of Canadian society while retaining their language, customs, food and sometimes dress too. 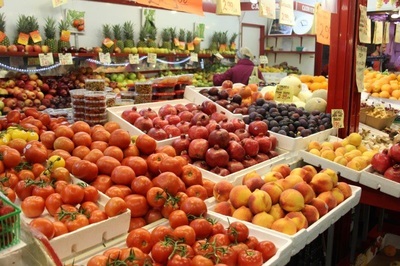 This means of course, that whichever ethnic cuisine you fancy, there are plenty of eateries to choose from with prices that won’t bankrupt you. 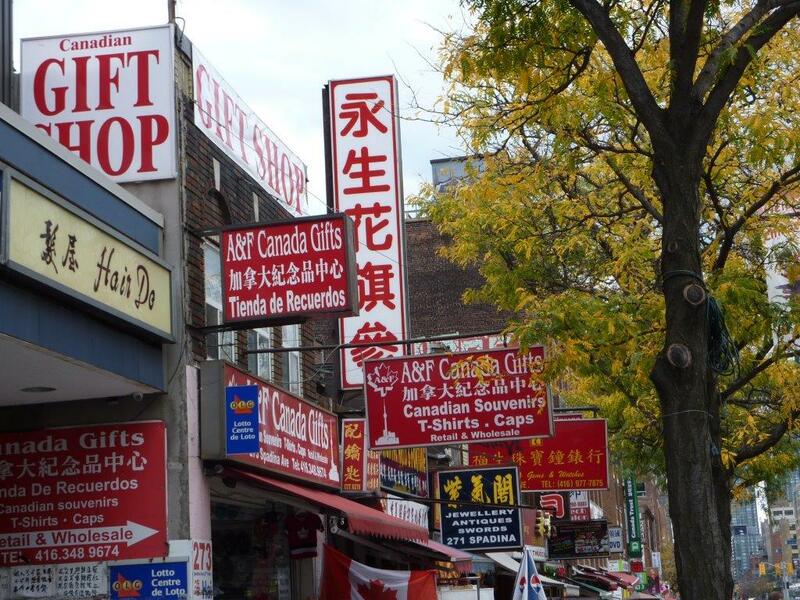 We particularly enjoyed a walk through China Town with its dual language street signs and unique shopping experiences, before entering the campus of the University of Toronto. 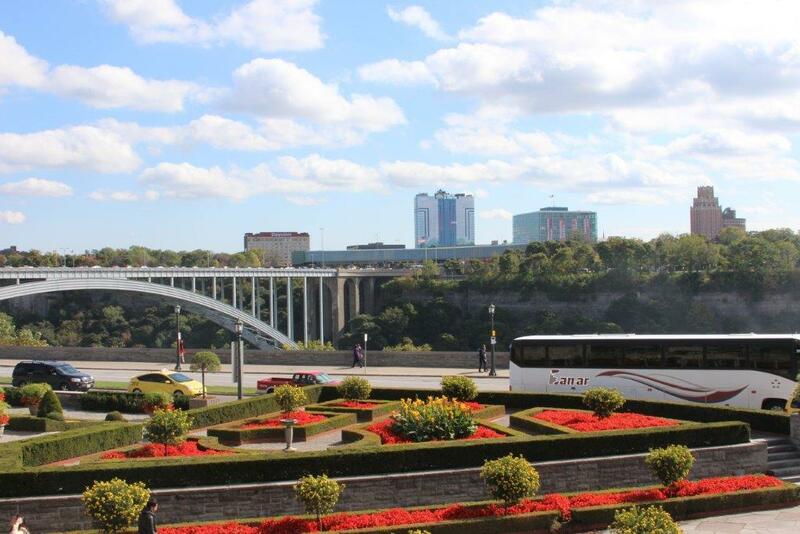 After two days of city walks we needed some wide open spaces, and where better than our next destination, Niagara Falls. 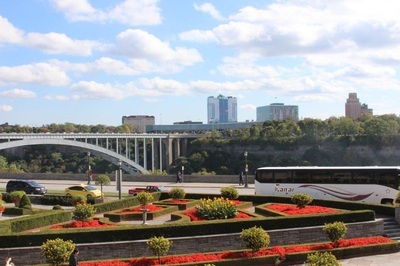 Many people think that the Falls are in a remote area but in fact they are in the city and the hotels are in walking distance. 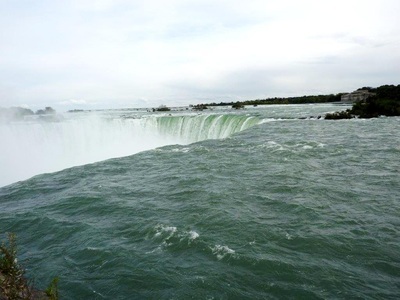 There are in fact three falls that flow into the Niagara River which forms a natural boundary between Canada and the US, but the Canadian falls, the Horseshoe falls, are the biggest. 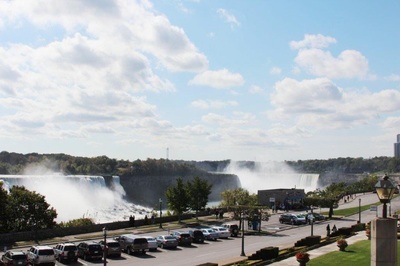 The other two falls are the American falls and the much smaller Bridal Veil falls, separated from the American falls by Luna Island, a mere 130ft (40m) wide. 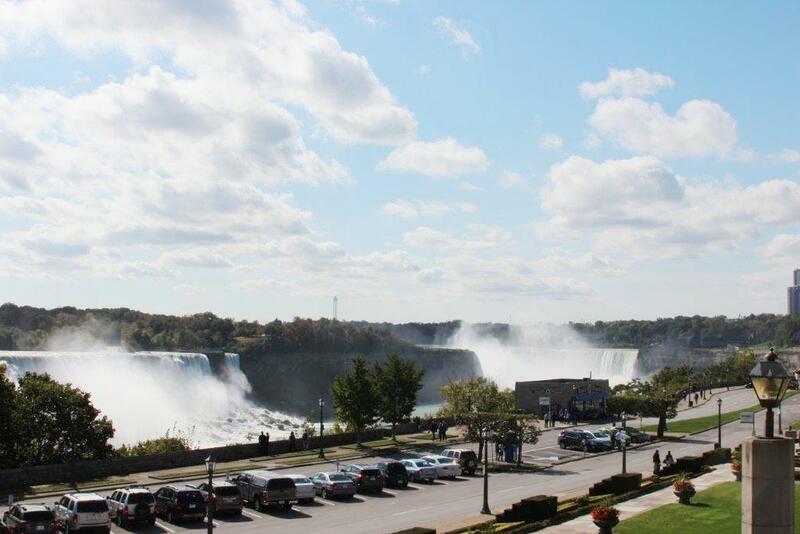 All three falls are best viewed from the Canadian side but recent passport controls have prevented a large number of Americans, over 60% of whom do not have passports, from walking or driving over the Rainbow Bridge that links the two countries. 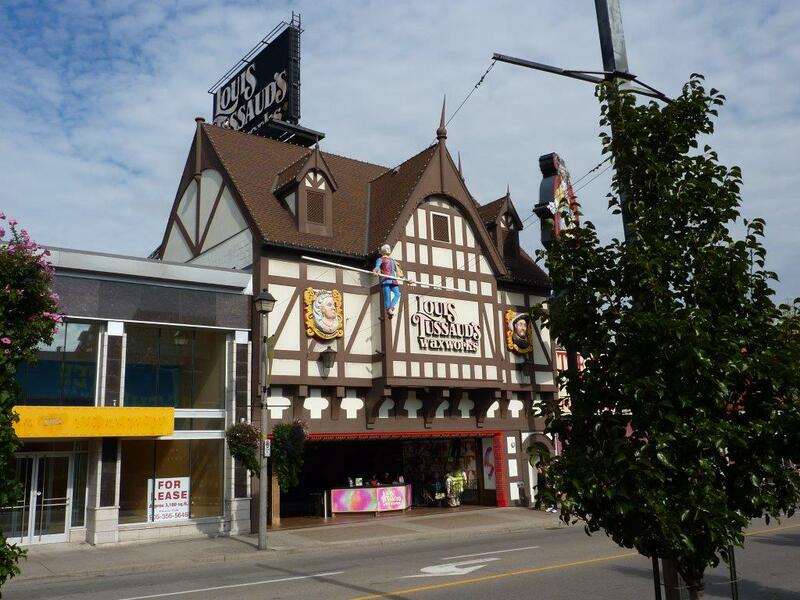 The area along the waterfront consists of well manicured gardens and smart hotels but just behind this area, downtown Niagara Falls and particularly the Clifton Hill area, looks more like an amusement park with a range of attractions, lower priced accommodation and eateries catering for families. 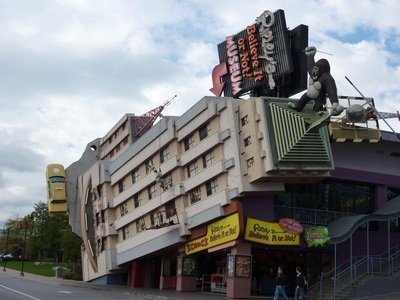 Attractions such as the upside down house, Ripley’s Believe it or Not museum and several wax works, one cheekily named ‘Louis Tussauds’, can keep kids, young and old, amused for hours. 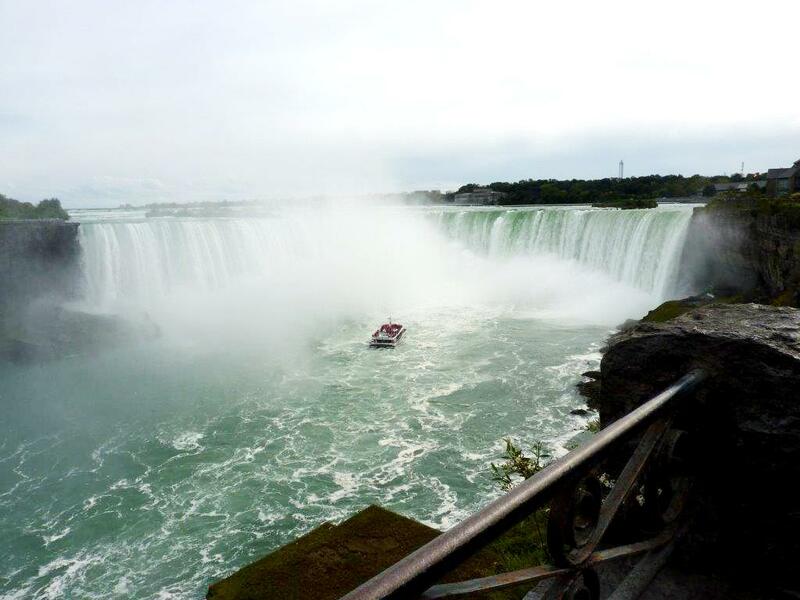 No visit to Niagara would be complete without a boat ride into the whirlpool at the foot of the Horseshoe Falls. All passengers are provided with hooded plastic ponchos to help keep out the water which, as you get closer to the falls, feels more like driving rain. It is from the foot of the Horseshoe Falls, cascading 2.2 million litres of water a second into the Niagara River, that you really appreciate the might of the second largest waterfall in the world. Whilst the Falls are the central attraction, the area boasts numerous vineyards, many of which are happy to welcome visitors in the hope that you might buy a bottle or two. 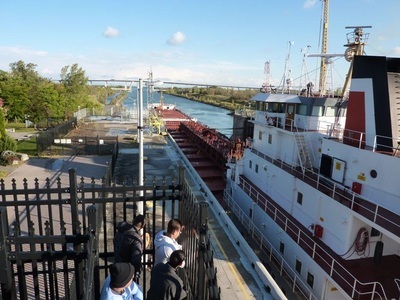 There is also the famous Welland Canal, allowing cargo ships to sail between Lake Ontario and Lake Erie, its seven locks allow ships to navigate the Niagara Escarpment which, in 1990, was designated a UNESCO World Biosphere Reserve. 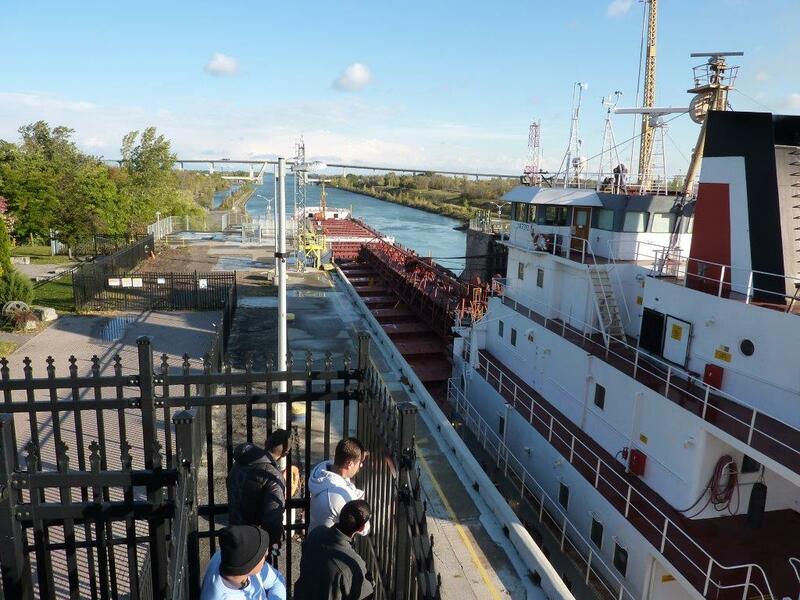 It is part of a network of canals linking the Great Lakes that allows cargo from both Canada and US cities such as Detroit and Chicago to reach ocean-going vessels at ports such as Montreal and Quebec. 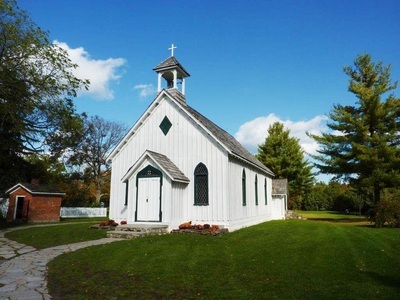 Nearby townships such as Niagara on the Lake and Jordan provide picturesque places to visit and the nearby Balls Falls Conservation Area, one of the earliest settlements in this part of Canada, includes the Grist Mill dating back to 1809 and St George Church, built in 1864. Our final walk was along part of the famous Bruce Trail. 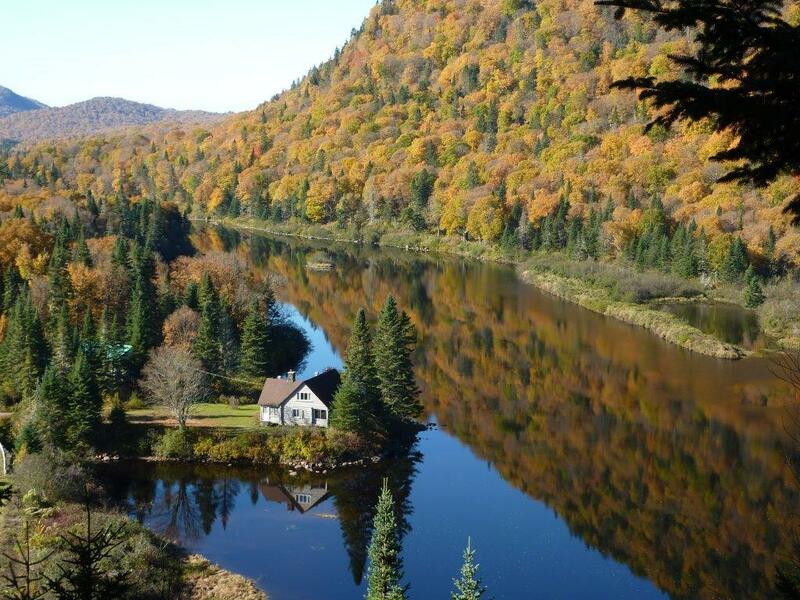 The trail follows the escarpment for over 500 miles (800km) and is the longest marked trail in Canada. 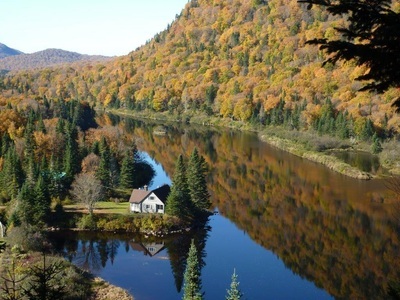 For many hikers around the world it ranks as a “must do” trail. We covered a lot of ground during our visit but this is just a slice of what Canada has to offer, from big modern cities to wide open plains, forests and mountains. 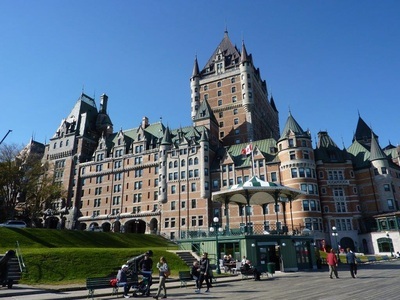 One thing all the places had in common, however, was the warmth and friendliness of Canadians themselves who, from the assistant in a local Subway to the staff at the smart city hotels, were genuinely pleased to see us, happy to help and keen to hear about our experiences in their great country. We had walked many miles along trails, sometimes steep and rocky, along canals and through cities; we had enjoyed great exercise, fresh air and making new friends with our fellow hikers. Truly a trip to remember. For more information on this Canadian holiday go to www.hfholidays.co.uk/holidays/niagara and for other walking holidays go to www.hfholidays.co.uk or contact HF Holidays on 0345 470 8558.